At Baker Hardwoods we specialize in claro walnut slabs. We mill locally grown California claro walnut into high quality slabs used in a variety of projects from large table tops, bar-tops, and counter tops and executive tables to medium sized benches and coffee tables. Some of our most beautifully figured wood is small cuts perfect for clocks, jewelry boxes, gunstocks, and musical instruments. We have a variety of quality claro walnut slabs. A bit of history: I've spent quite a bit of time in Japan. Like most people I find the contrasts interesting. 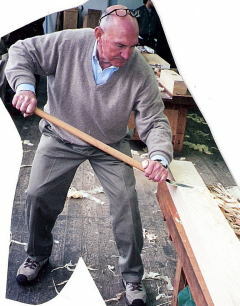 Here I am working a spear point plane. Yes, its a lot slower than the equipment in our shop. In addition to our family wood business, we have world class woodworker Kordell Baker. 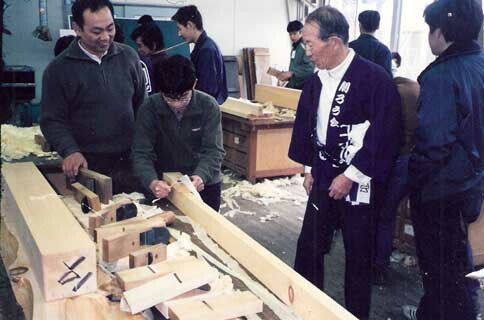 Kordell spent 6 years in Japan making furniture with the Nakashima connected group on Shikoku island. 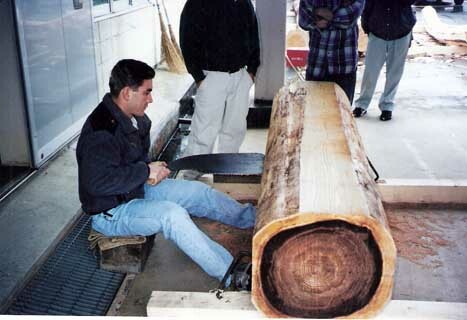 In this image we see Kordell hand milling a log with a hand saw at a woodworkers convention. This image shows a student planing a slab. Notice that he uses only string while the master woodworker observes. These images were taken at the Kezurou-Kai competition in Japan in 2000.